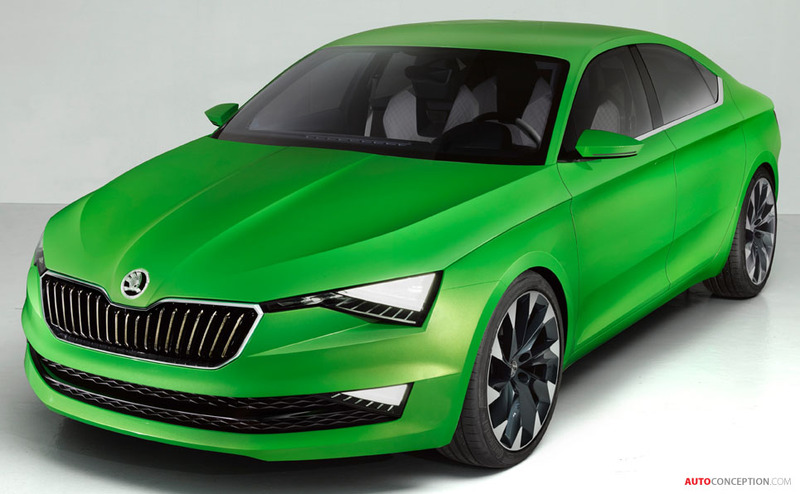 SKODA’s VisionC design concept has made its official world premiere on the eve of the Geneva Motor Show. 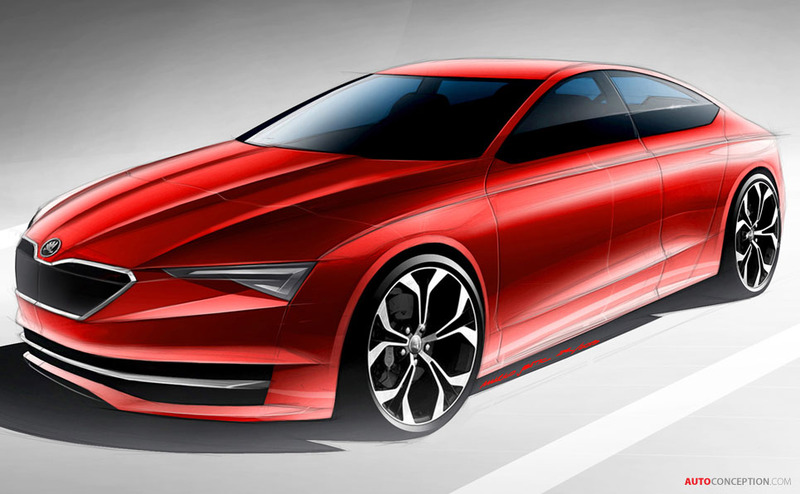 Based on the Volkswagen Group’s new Modular Transverse Matrix (MQB) technology, the five-door coupe represents the next stage in the development of SKODA’s new design line adopted three years ago. 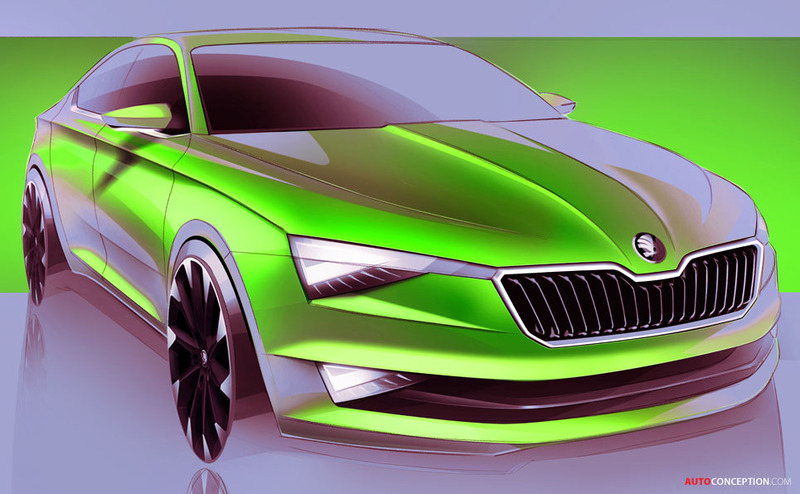 SKODA chief designer Jozef Kabaň and his team set out with the goal of “avoiding all ornament and frills” when designing the concept car. The wide radiator grille and distinctive shape of the headlamps with their tapering triangular form dominate the front end. The headlamp contours are sharp-edged, almost like cut glass crystals. 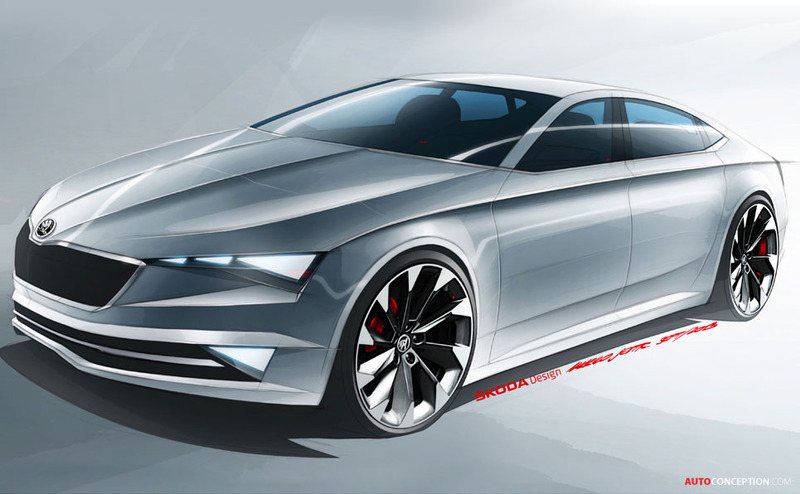 In combination with the fog lamps, also triangular, they give the car a three-dimensional four-eyed look. 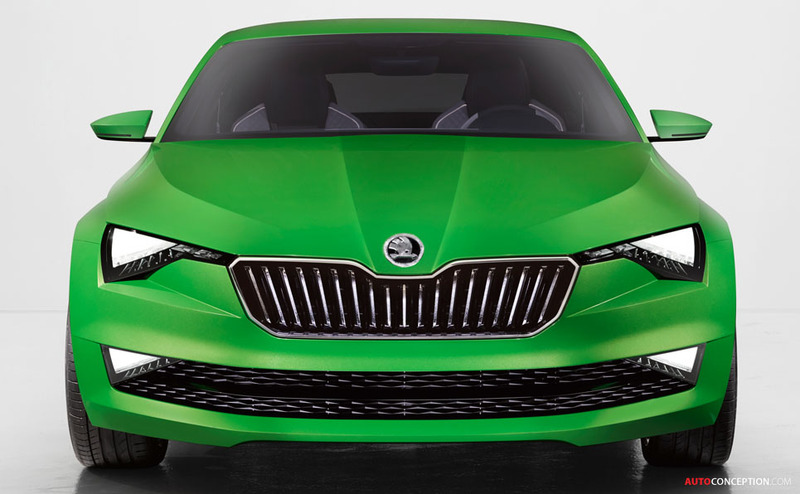 The grille retains its slightly curving form, it is however somewhat flatter and broader than in current SKODA models. The vertical fins are a interesting feature. In the design study, they are hand-made crystal elements with indirect illumination. In the lower area of the front view, a large air inlet extends over the entire width of the vehicle. The bonnet is elongated and is accentuated with longitudinal chamfering to the right and left, extending in a slight arc from the A pillar through to the transition between headlamps and radiator grille. Jozef Kabaň describes it as “an expression of emotion, form and movement.” This reinterpreted bonnet bears the SKODA logo on a rounded bonnet nose stretching into the radiator grille. From the side view, VisionC features clean lines. “The form is intended to look attractive. We have dispensed with superfluous corners and edges,” says Kabaň. As well as a high tornado line, a low-lying front windscreen and short overhangs, the car features large 19-inch aluminium wheels. 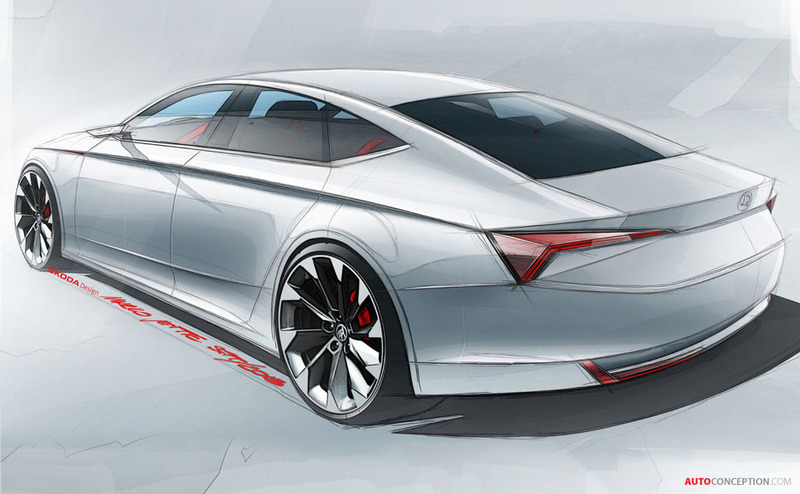 The roofline sloping down at the back over the C pillar, the flowing lines without visible gradations, frameless side windows and the prominent side-transition to the tail – all this is “aesthetically pure”, say the designers. Typically for a SKODA, the lower side window line slopes gradually backwards, sweeping down to the rear side window of the back door. 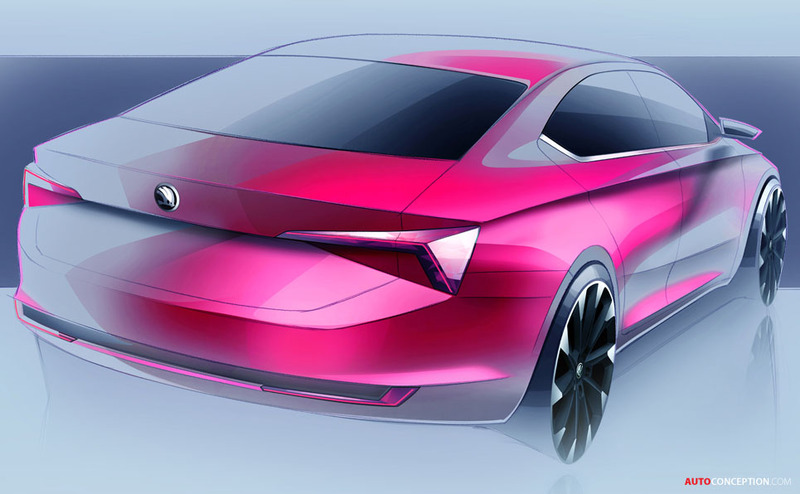 This SKODA design feature described by the designers as a ‘fin’ was first used in the brand’s model design on the new SKODA Octavia, and is continued in the VisionC as a distinctive feature. The designers have also made the door handles ‘disappear’. The door handles – running directly under the tornado line – are set invisibly into the external door trim. To open the doors, you press the handle – the door then comes out automatically and can be operated. The rear lights reach far into the sides of the vehicle. 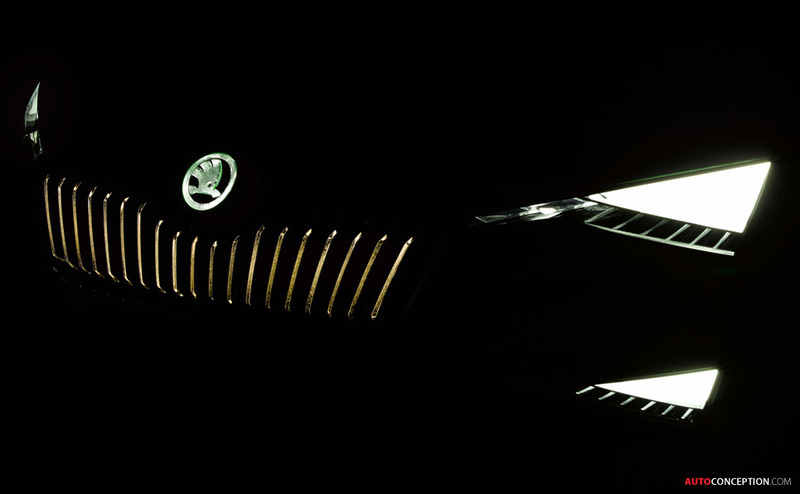 The C-shaped lights, a typical SKODA form, are divided into two parts, with the C being separated horizontally through the middle. The upper part is in the tailgate, housing all the lighting functions. The lower part of the C is formed by the reflector elements (cat’s eyes) inset into the bumper. 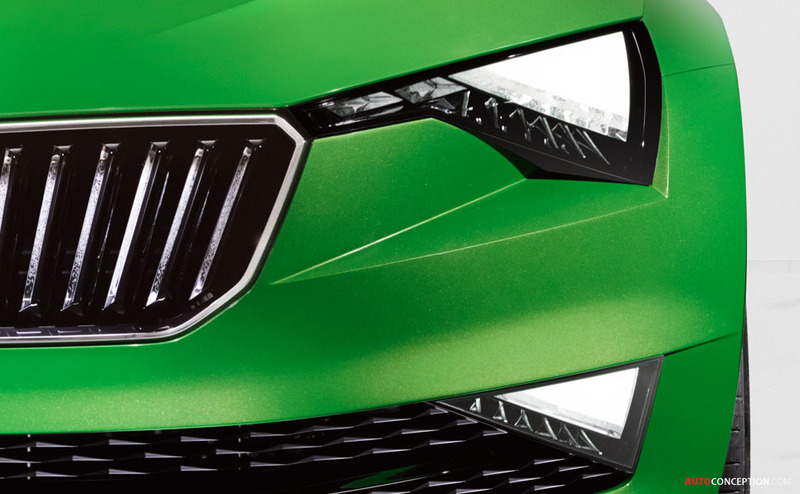 Triangular-shaped embossing in the tailgate (described by the designers as “triangular cubist elements”) aims to identify the VisionC as a member of the SKODA family. On the inside, four individual seats provide room for four people. Like the exterior, the internal design sees a recurrent interplay of convex and concave surfaces. In front of the driver there is a large 3-D display, while each rear passenger also has a foldaway multimedia screen. A screen integrated into the back section of the central arm rest shows basic information on vehicle operation. The centrepiece of the dashboard is the touch-sensitive multimedia screen which projects from the dashboard, appearing to be hung-up in the interior. The visual effect is amplified by accents of back-lighting. 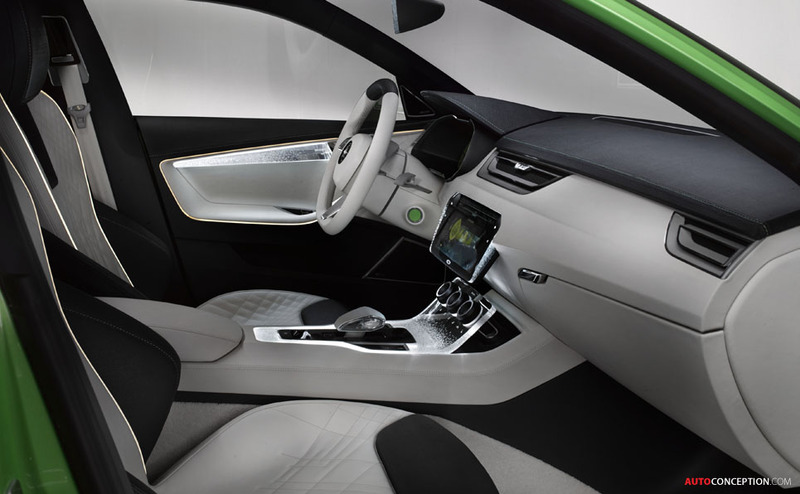 There is a continuous transition between dashboard and doors via a ‘light line’ that unites both elements visually. The light line runs over the entire width of the door, circles the armrests and ends in the seat-belt tensioner. Additional visual accents are provided in the doors with backlit crystal decorative elements. Underneath the exterior body, a close-to-production drive system incorporates a bivalent 1.4 TSI/81 kW CNG and petrol turbo engine that SKODA claims will accelerate the vehicle up to a maximum speed of 133 mph. In CNG mode, the vehicle consumes 3.4 kg or 5.1 m3 natural gas per 100 kilometres, corresponding to a CO2 output of 91 g. According to SKODA, this value emphasises the study’s closeness to reality and is below the much-discussed limit decreed by the European Commission for 2020. Improving aerodynamics and minimising weight were priorities for both SKODA’s engineers and designers. The end product is a car with a drag coefficient of 0.26. 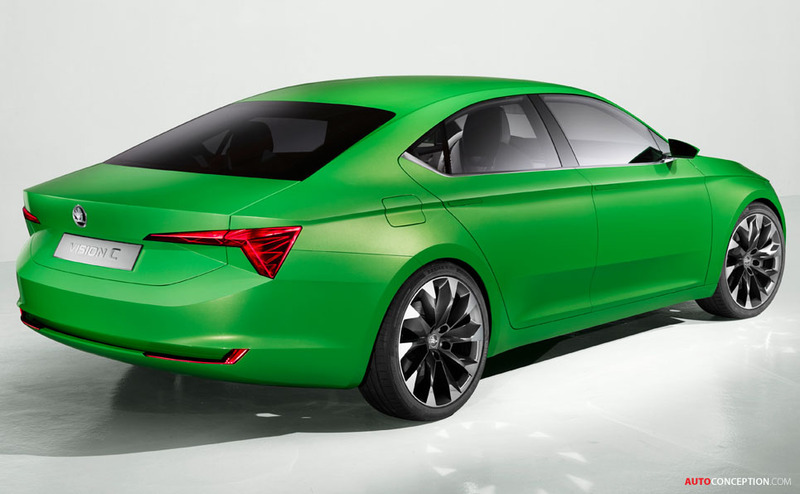 In terms of weight reduction, SKODA has used carbon-fibre for the gas tanks and extra-light hot-formed steel. Important bolt-on parts such as the wings, bonnet and doors are in aluminium.